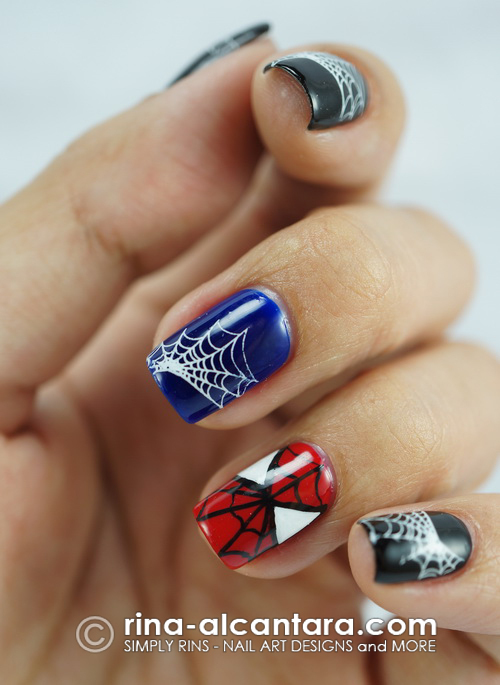 I created 2 accent nails and played with the colors of Spiderman's costume. Normally, I would decide on painting an easier design on my right hand since I'd be working with my weaker hand. But for this Spiderman design, I think I made a boo-boo because I had a harder time painting the spider logo than the face of Spiderman. On my right hand, I painted the Spiderman logo. I know I could make this better. It's not even centered on my nail. Err. But I really was so sleepy so this would do for now. I have high expectations for this movie and hopefully it will not disappoint me as much as this week had. I really need to break away from all the bad things that's been happening to me. Lovely and such crisp artwork, as always. Love your stuff. And I love Spiderman too - I can't wait for the movie to open! This is just amazing! Nice work! they're all pretty! i especially love the spiderman face. Sorry to hear you've had a rough week. I will be wishing for better times for you. Take care. Have you watched this amazing movie? I love this, its very well executed. Great job! These look fantastic Rina, I love it! And totally feel you -- things have been hard over here too and it's really time for the dam to break. On the upside though at least we can always make pretty things :) I hope life eases up on you and July is full of joy and laughter. Btw, please join my giveaway here.